This entry was posted in Waste less recipes and tagged almond, Cap'n Crunch, cereal, coconut, crunch berries, dried fruit, flax, granola, green, living green, oats, sustainability, sustainable living, waste less, yummy by Jean-François. Bookmark the permalink. Great post. I still get a major craving for Captain Crunch…peanut butter flavored for me though. I don’t think I’ve eaten it for close to 20 years! My mom makes excellent granola and all four of us in my household fight over it whenever she sends me home with a batch. I don’t know why I haven’t made it myself yet…maybe I’ll give this a try. You might be able to satisfy that peanut butter Cap’n Crunch craving by mixing a little peanut butter into the oil and honey (not sure how that will turn out) – or just adding some peanuts into the mix. At the farmer’s market, I’m always on the lookout for fresh crunch berries to add to our granola, but no luck yet. Don’t even know when they’re in season. Shh. Hey Angie and Jean-François. I’ve started another blog. Like I don’t have enough to do already. It’s a bit of a platform, a soap-box covered in grass. Edible grass. Tee hee. You – my most awesome and awesomely respected blog-buds – are the first to know. My gravatar is the same (I haven’t figured out how to change it at whim) but if you click it, it’s linked to the blog Greens for Good. You have two followers. Really looking forward to seeing where you go with this –the topic is close to my heart. Yum. I know what I’m doing today. My love for granola came late in life (recently in fact), when I discovered a blogger’s easy recipe for making it at home. It was like an ah-ha moment! Great for snacking, morning cereal (with fresh fruit added) or as a topper for other things. As with many things (Angie can attest to that one), I asked myself, why the heck hadn’t I done this before? Thankfully, you had Bonnie Lee. The “lack of packaging” part is why I’m tweaking my ways. It is the most costly part of a breakfast cereal. When corn prices go way up, it’s not the the cereals that will see a significant increase, I’m betting. That cello bag inside the recyclable box of cereal, keeping the product fresh? NOT recyclable. It is great food to have on hand, particularly for single guys, who in my experience pretty much live on cereal – well, I did anyway. Speaking as someone who just had onion sambal and roti for breakfast, I could certainly have used some this morning. And yes, all that packaging is such an incredible waste of resources, so often wrapped around stuff that doesn’t quite taste or look like food. Yup, back in KL – and I guess the grass is always greener on the other side of the Pacific. :) I actually love the food here – roti included – but after a couple of weeks, a little granola would hit the spot. I think it’s just home cooking and my usual dinner companions (B and the cats) that I miss. that looks so delicious. I hate buying granola at the store, even though my store is one of the most beloved supermarkets in the USA. It’s expensive and by the time you get to the bottom, it’s too crumbly and many times (I confess) I throw it out. I’ve been meaning to make granola all summer, and I’m preheating my oven right now to try out your recipe. (I even bought some flax seeds at the public market on a whim). Thanks for this post and beautiful presentation. Let me know how that works out. I hate the store bought stuff too – mostly because it’s just way too sweet for my taste (and you pay a lot for so little). Once you’ve made a couple of batches, you should be comfortable playing around with the “recipe”. Really, what it comes down to is adding just enough oil & honey to bind everything together. Our July batch was just an exercise in using up what we had left in the pantry. Hahaha love the comment about the shoebox oven! I can relate. But people do really creative things with toaster ovens here. I also love a crockpot to avoid baking in the heat of summer. I’ve yet to see a crockpot granola recipe though…. Wow, toaster ovens. I dreamed of a toaster oven. All we had was one of those little fish grillers under the stovetop – that and a rice cooker, which we used for a lot, including making banana bread. Ooo that sounds good. My kitchen was big enough that I could buy an oven, but I can’t even think of touching it while it is this hot. But I’ve been making chicken and sweet potatoes, two of my staples, in the crockpot. I know you can use rice cookers in the same fashion! Now that we’re in LA, I won’t need to test that. Good luck on the cherry & cranberry hunt – though, if you can’t find those, pretty much any dried fruit works well. A blast from the past! I wasn’t too much of a Captain Crunch fan, because of those darn sharp edges and I didn’t like sugar much. I was the weird girl who had stir-fried mushrooms or grilled cheese. Sometimes I would even take a hard-boiled egg with me on the bus and eat it. It really is a wonder I had any friends. But nowadays I am a bit more normal, still preferring savoury stuff but I love homemade granola. Probably because I can control the sugar. I make it every two weeks and it goes camping with us too. Such a versatile little pile of dried bits and bobs. It’s funny how we all have slightly different techniques for this most simple of foodstuffs. In retrospect, I’m not sure how I managed to eat the stuff. I think it might have been because of the sharp edges. They hurt, but it was a good hurt. You knew you had eaten something significant. The pain spoke of food with a certain gravitas. Or maybe it was just my sweet tooth at work. Then when we started a war with packaging in our zero waste effort, we gave up all cereal. We too eat a lot of granola for breakfast now. And eggs and yogurt. And muffins I make from scratch. It’s funny. I didn’t remember those commercials until you put that up. And then the sound of his voice saying, “Anytime’s a time for Captain Crunch” came crashing back. Thanks for the memory! And I’m loving the recipes! Great site!!! Thanks, Jennifer. I have fond childhood memories of the Cap’n too, and that leprechaun (though I never ate his cereal – I drew the line at marshmallows). As a kid, the marshmallows were the best part! I remember the first time I felt truly independent, I’d moved away from home and bought my own groceries. I bought boxes of Lucky Charms and ONLY ate the marshmallows—tossing the rest of the cereal. (As our mother wouldn’t let us do this, of course.) What a moron! ha! That was nothing but sugar. Count me in also as a big fan of Crunch Berries! I wouldn’t have turned down any of the Cap’n Crunch line, but Crunch Berries was definitely the clear winner. And having a fruit thing in your cereal is healthy, right?? 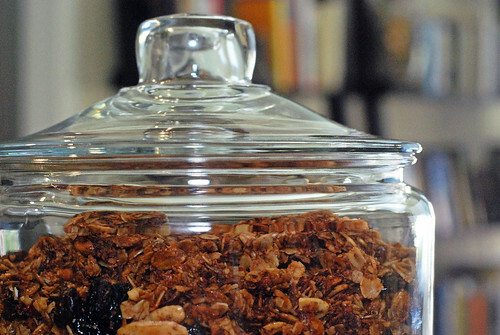 The granola looks and sounds fabulous – and fairly simple to make. Never thought to try. Alas, I suffer from shoe-box oven syndrome myself, so will need to wait until I’m stateside. Bookmarked! Yes, the one big perk in moving to the states was getting a decent sized kitchen with a real oven. I didn’t know how much I missed it until I had one again.